If you are on the hunt for a new pair of running shoes, you know just how difficult it can be to find a pair that is right for you. You need comfort, traction, durability, and more. However, there are so many different brands and models of women’s running shoes out there, finding a good one can make your head spin. Yet, we here have found a decent running shoe, which is why we are here today doing this ASICS Women's GEL-Venture 5 Running Shoe review. In our opinion, it is one of the better running shoes for women out there at this time. This is a very recent running shoe that was released by ASICS just a few months back. This shoe is good for road running, it is fairly comfortable, and has a decent level of durability too. Let’s take a closer look at this particular running shoe right now to see what it is all about. If you are an avid runner, a woman, and you cannot get enough exercise, the ASICS Women's GEL-Venture 5 Running Shoe might just be the best choice for you. While these things do have good grip, the traction is designed more for road running than trails, just so you know. These shoes have a fairly high comfort level, which is nice if you often experience foot pain, both in your daily life and when exercising. They are lightweight and breathable running shoes, so they are also great for warm weather. When you buy the ASICS Women's GEL-Venture 5 Running Shoe, you get 2 running shoes that come complete with laces, a removable sock liner and more. What is neat here is that you can remove the sock liner and replace it with an orthotic insert of your choosing, which can help cut down on foot pain even more. Something that we like about the ASICS Women's GEL-Venture 5 Running Shoe is that it comes with a high-abrasion outsole. In other words, it is made of really tough rubber that can easily withstand a lot of wear and tear. While the outsoles are tough and durable, keep in mind that their grip pattern is very good for road running, but not the best for running trails. Speaking of road running, these shoes are a good option to go with if you like running during the dark hours as they come with reflective strips on the exterior. When it comes to comfort, these shoes are pretty top notch. For one, they feature an upper that is mostly made out of mesh. This is convenient because it helps to keep your feet cool and well ventilated, plus it helps stop the buildup of moisture, not to mention that it is fairly lightweight as well. Furthermore, the removable sock liner here is great in terms of comfort, but if you need to remove it to put in your own orthotic inserts, that can definitely be done. This makes the ASICS Women's GEL-Venture 5 Running Shoe a good option for anyone that needs special inserts. However, with that being said, these shoes do come with a great GEL cushioning system, especially in the heel of the shoe. These particular running shoes can definitely support your arches well and absorb a good amount of strike impact too. Although this shoe is not ideal for running in really wet conditions or on trails, overall, we think it is a great option to keep in mind. There is not really too much to say here, as these are pretty basic running shoes. They are good shoes, but basic. Simply lace them up and go for a run; it really does not get much easier than that. We would recommend wearing moisture-wicking socks, thin ones, so your feet do not get too hot and so you are not weighed down too much. We would also not recommend running trails as there are road running shoes, plus you probably do not want to wear them if it is raining hard as they are not really waterproof. If for whatever reason you do not like the ASICS Women's GEL-Venture 5 Running Shoe, maybe because you like running trails more than you like running roads, you can take a look at the Salomon Women's XR Mission Running Shoe. In many ways, both of these women’s running shoes are fairly similar, but the ASICS are better for road running, while the Salomon is best for running trails. 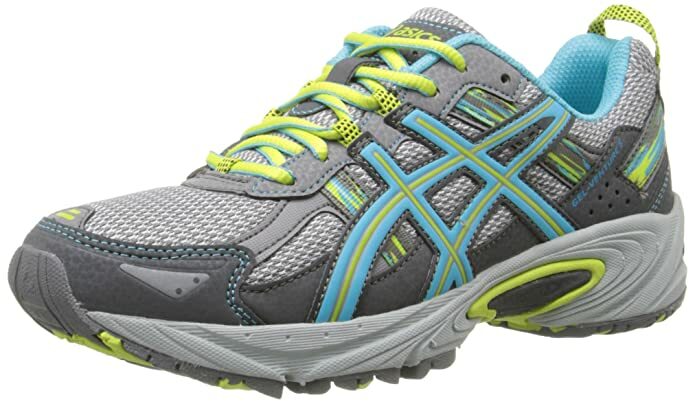 As you can see, the ASICS Women's GEL-Venture 5 Running Shoe is a good all-around running shoe. No, it is nothing overly special, but it is also not too expensive. It is fairly comfortable, quite durable, and has good traction on roads.